OLED display with blue yardage and yellow battery indicator. Tool free micro adjust windage and elevation. Laser etched windage and elevation mark. 2nd / 3rd axis adjustment. External activation trigger adheres to bow riser. Multiple bow and quiver mounting points. 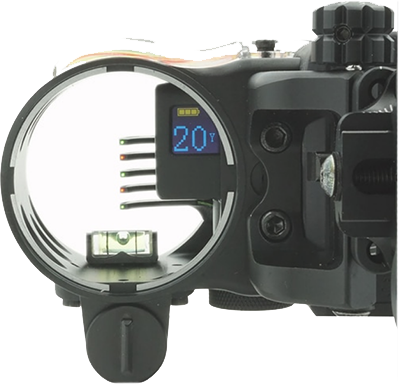 Detachable red dot visible laser for easy calibration. Powered for a single CR2 battery. Full angle compensation with yardage displayed as horizontal distance. Fully contained .019 fiber optic pins.